On January 11, the Africa Growth Initiative at Brookings released its annual Foresight Africa publication. This year’s report focuses on six key priorities for the region in 2019. The third chapter, Harnessing Africa’s Youth Dividend: A new approach for large-scale job creation, examines Africa’s demographic dividend and the urgent need to create good jobs for youth entering the labor force. 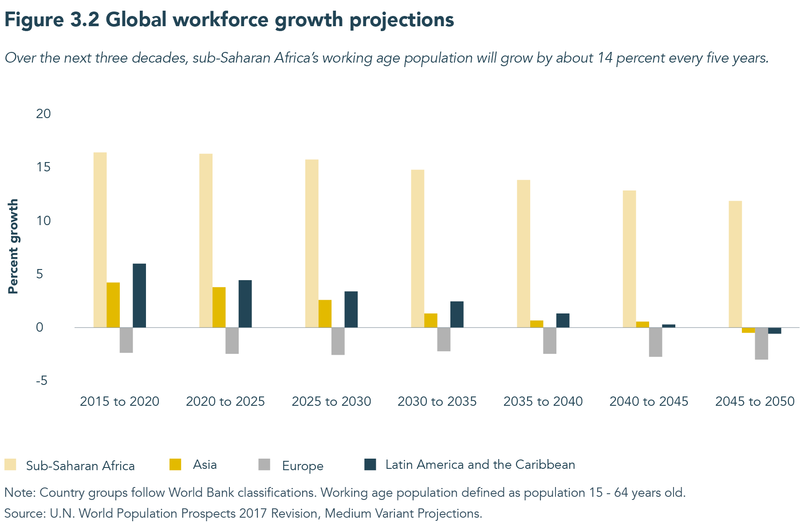 As Figure 3.2 below shows, sub-Saharan Africa’s working-age population is growing rapidly and will continue to through 2050. On average, the region’s workforce will grow by 14 percent every five years, with the growth rate slowing down closer to 2050. In comparison, Europe’s workforce is already shrinking and is expected to continue to do so through 2050. Asia’s workforce will keep growing over the next two decades, although at much slower rates after 2030, and will start shrinking from 2045 onward. Similar dynamics are observed in Latin America and the Caribbean where workforce growth will turn negative after 2045. In his essay, John Page, senior fellow at Brookings discusses the challenges of creating jobs for Africa’s growing labor force. Manufacturing, traditionally associated with structural change in developing countries, has played a limited role in Africa’s development. Manufacturing’s share of GDP is lower today than in the 1980s and only accounts for 4-5 percent of employment. He notes that other nontraditional sectors such as tourism, agri-businesses, and some services based in information and communications technology show potential for large-scale job creation. These “industries without smokestacks” exhibit strong productivity growth, high labor intensity, and economies of scale similar to manufacturing in Africa. 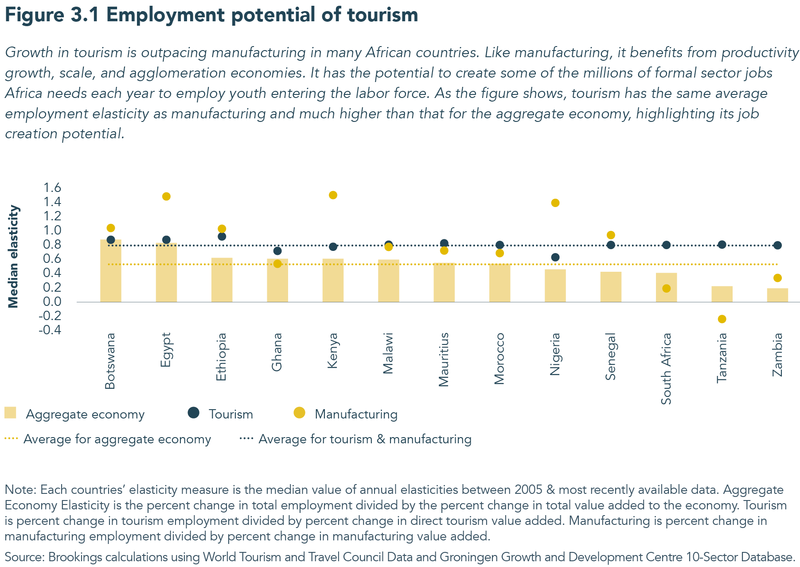 As Figure 3.1 shows, average employment elasticity of growth for tourism is the same as that for manufacturing and higher than the aggregate economy for a group of African countries, highlighting the sector’s potential to create some of the millions of jobs needed in Africa each year.